Thai Food Open Neon Sign 20'' Tall x 37'' Wide x 3'' Deep by The Sign Store at Thai City Deals. MPN: N105-3034. Hurry! Limited time offer. Offer valid only while supplies last. Thai Food Open Neon Sign 20'' Tall x 37'' Wide x 3'' Deep, is Handcrafted with Real Glass Tube Neon Sign. !! !Made in USA!!! Colors on the sign are Blue. Thai Food Open Neon Sign 20" Tall x 37" Wide x 3" Deep, is Handcrafted with Real Glass Tube Neon Sign. !! !Made in USA!!! Colors on the sign are Blue. Thai Food Open Neon Sign is high impact, eye catching, real glass tube neon sign. This characteristic glow can attract customers like nothing else, virtually burning your identity into the minds of potential and future customers. Neon signs can be left on 24 hours a day, seven days a week, 365 days a year...for decades. There is no light form in existence that has the visual impact of neon. This is a 100% hand crafted, real glass tube neon sign. Thai Food Open Neon Sign is made by an experienced neon glass bender. Ready to use indoor signs. Sign is mounted on very rugged black clear backing. Top and bottom protective sides to avoid breakage in shipment. 110 volt U.L. 2161 listed transformers that plug into a standard outlet. Cool Quiet Energy Efficient - Uses Less Power than Standard 60 watt bulb. Easy Install, hanging hardware & chain are included 6 feet Power cord with standard transformer. Thai Food Open Neon Sign is for indoor use only. 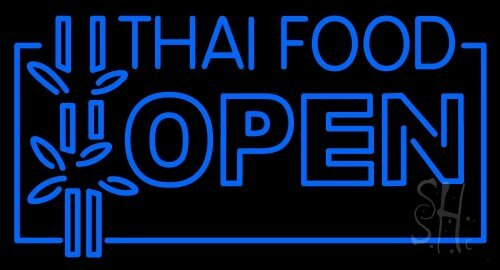 Thai Food Open Neon Sign is bended 4 sides with ABS material. We provide 1 Year Warranty on electrical components and on standard transformers. Please contact us for rush shipping before ordering. Outdoor, Flashing and color customization possible - please contact us for proof before placing order. 100% No Breakage Guaranteed. YOUR NEON SIGN WILL ARRIVE TO YOU IN EXCELLENT CONDITION. WE HAVE LESS THAN A 1% BREAKAGE RATE. Thai Food Open Neon Sign is handcrafted with Real Glass Tube Neon Sign. Sign is mounted on very rugged black backing.